Michelle was without question the most dedicated teacher I’d ever met, causing some to label her a missionary of French language and literature. In late 1985, when we were both teaching at Xiamen University, Michelle was hoping eagerly that one of her students would invite her to spend part of New Year’s vacation at her home in a farming village in northern China. I’d never before seen this voluble Frenchwoman as excited as she was when the invitation finally came. It took four days by train. We went “hard seat” [third class] because my students couldn’t have afforded anything else. We had to change in Shanghai and buy tickets for the rest of the journey. Immediately in the railway station I was escorted out of all the noise and confusion into the waiting room for special guests. But I would not leave my students, so they had to find ten seats all together in the special waiting room. We were given tea, and they asked about my ticket. We had no supplement tickets for seats. Of course they wouldn’t let a foreigner stand up all that way or sit on the floor. Since again I wanted us all to have the same treatment, they had to find seats on the train for all of us. Most of the students wanted to see Shanghai, so they went out, and just two of us stayed behind, the student who had invited me to the wedding and I. I asked the old man who worked in the waiting room to watch the luggage so we could go out. The girl would never have left the station on her own, even though we had many hours to wait. She’s a village girl, the only one in the village who’s ever been to the university, and her parents had warned her about the big city. So we took a tour of Shanghai together. When we arrived in the main town near her village in the North, it was a bit embarrassing because another of my students had written to his parents saying I was coming. Since they were well-connected, they assumed I would stay with them, and they came to pick me up from the railway station. I explained that I was invited to the wedding of my student’s brother. I said I would come and stay with them later. So that was okay. In the village it was very cold. They had no heat, and it was freezing. But then we also have no heating in the countryside in France. It was cold for me because, as the honored guest, I had to sit and drink tea. I would have preferred to help in the kitchen. But at night I was warm because I had brought my hot water bottle, and I took it to bed with me. The first day a lot of people came to see me. My student was embarrassed when we opened the door and there were two thousand people—everyone in the village—who had come to see me. They were very nice, though. Since her mother couldn’t write, she had to memorize the names of the people who brought the cloths. When the sons of those families were married, she had to bring one to each wedding. The relatives of the groom came together, and as a part of the ceremony they announced how much they were contributing to the marriage expenses. Even with many members of the clan giving money, the relatives’ contributions were still very small compared with what the father of the groom had to spend on the marriage. The couple had to have everything for their household, and the guests came to inspect. The father complained to me that it cost too much. He wanted to know if it was the same in France. Also on the day of the wedding, the town crier went all over the village announcing the marriage in a very loud voice. In the old days, the boy’s family went to fetch the bride from her parents’ house in a sedan chair. Now they use the car of the village. This was a modern wedding. The bride wasn’t wearing a red gown and a red veil, just trousers and a red jacket. It was all very simple. There were about two hundred and fifty guests at the wedding. Tables were set up outside, and all the guests were served a simple meal. Earlier there were many traditional games and jokes. My student told me that at her older brother’s wedding four years earlier there was much more of that. There was no bowing. I think the bowing has been replaced by photographs. You have a photograph taken together, and then you are married. That’s very important, the ceremony of the photographs. Then the day after the wedding, there was a little party at the home of the girl’s family. She went back to her family, and he went along. Apparently the bride’s people, who hadn’t been the day before to the boy’s place, came to her mother’s. Each family celebrated separately, you see. I think modern Chinese weddings reflect what marriage means for the society. Our concept is that when a couple is married, they form an new family. Here it’s not really a new family because the young couple depends much more on their parents. 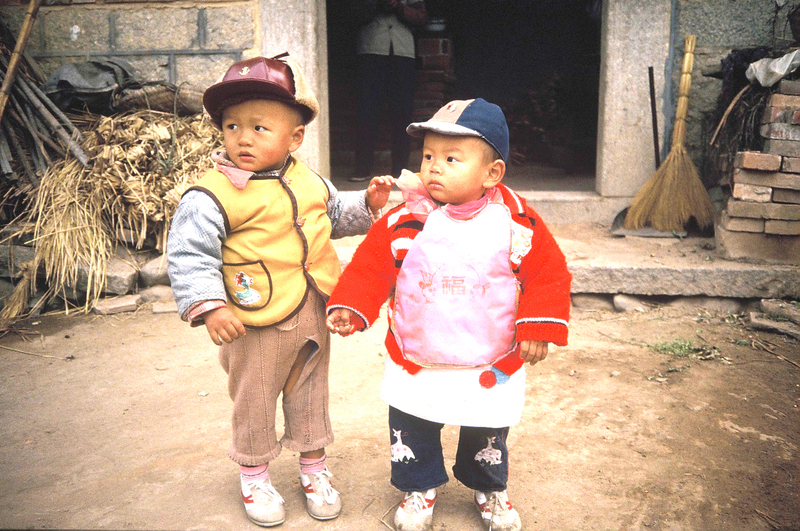 Traditionally, the Chinese couple becomes part of the boy’s family, and the young wife is little more than a servant. Young women won’t accept that now. Now it’s halfway. They don’t really know what it is. My student’s family’s budget is a little complicated because they have the land for three households, but in fact they work together. With the new system, land has been allocated to the peasants again, but they have to be registered as peasants to get land. The oldest brother is working as a teacher, and the second one is a driver, so they are not peasants. Their wives have the land. One plot is allocated to the wife of the oldest brother, one to the wife of the other married brother, and the third to the father and mother and the three unmarried children who are not yet independent. Most of the work is done by the father on the three plots of land, and the brothers and their wives help from time to time. They told me that usually women don’t work in the fields in that part of China except for something important and short-term, like picking cotton. It’s like our place in France where women work in the courtyard with the hens and the ducks, in the house and in the garden. In South China—in the regions where you have rice and all those crops that require lots of work—women do most of the work in the fields. But where I was, they have wheat and potatoes and cotton. Plowing is done by the men. Once the crop is planted there is little to do. Later you have to pick the potatoes, but that’s a job of a few days. My student does it when she goes home. The family is organized around a courtyard. In France it’s similar. My student’s house is a long, long building with three different entrances on the courtyard and each entrance opens to two rooms. One section is for the father and mother, the central one for the young couple and the last one for the other brother. When you have houses arranged around a courtyard like that, people often share a kitchen, although they can also cook in their own place if they like. I saw common kitchens in Beijing too. People get along better than we could imagine with one kitchen for three or four families. The fact that they are used to it already—at least the people from the countryside—perhaps explains how they do it so easily. My student’s family lives like an extended family because they share meals. The older brother has a little baby, and usually he and his wife do their own cooking, but not always. The cousin and his wife come over often, and other people do too. If it is dinner time, they have an unspoken invitation to dinner. You don’t really know who will be there. People come in and stay a time and just eat there. I couldn’t find out exactly how the customs work. Not everybody can come and eat. Immediately after the meal, all the neighbors who have no television came over to watch. People are used to this informality. That’s why we often find their actions with us—often as strangers—a bit strange. They feel they don’t need to ask if they can look at your books or sit down and go through your photographs. It’s very natural. A neighbor comes in, “Oh, I’m a little cold,” she takes a blanket and makes herself comfortable without asking first. In villages it’s mostly family. Even if you are not related, you say, “Well, it’s the cousin of a cousin, so it’s half a cousin.” Perhaps it’s not like that in the States, but in French villages it’s like that—in some remote places like the one I live in, you know? Even if people are not related, they find a way to be, so it’s all family still. Then you had to answer, “I am going to see my aunt so-and-so.” When we crossed three streets, we met at least fifteen people. Each of them greeted us by asking where we were going. So then I understood that it’s very difficult to switch to our way of not asking questions. To them it’s just natural to ask. Even if they meet people who are surprised at being asked all these questions, it’s a difficult habit to break. My student is very funny. She speaks perfect putonghua [common Chinese], but at home she immediately switched to the local dialect—immediately—without noticing herself doing it. People tried to teach me some of the local language as well. I noticed in the countryside that the pressure to have boys is very intense. Country people are now allowed to have just two children, but I met two families that had two girls and a boy. If you have two girls, you try again even if it’s a big risk. [People may lose benefits, have to pay fines or be forced to have an abortion.] In my student’s family the youngest boy was very spoiled, even though the family was very open-minded compared to other people. They had insisted on sending the girl to the university. The village people were really sympathetic to me as an outsider. You could feel it. I think usually people in the countryside are nicer. The less contact people have had with foreigners, the nicer they are. They are just interested. You can see that with the Hui-An [a Han Chinese minority] girls in Xiamen. The way they stare at you is completely different from the others in town. It’s just curiosity, and it’s all right with them if you stare back. Sometimes in town, people look “aaah!” at foreigners but without wanting to know about us. That’s why we feel it’s so intrusive. Perhaps because the family knew I was coming and people were told how to behave around me, I had no funny questions like, “Why is your nose that way and why are your eyes that way?” No. I couldn’t believe it. Never questions like, “Why did you buy that? How much did it cost?” They asked about life in the countryside in France. “Do you have cotton? Is it cold in winter? How do people work? Do the women work in the fields? How do they marry?” Intelligent questions that were a sign of real interest in people they think are like themselves. “Well, there are peasants too in France. How do they live there?” Perhaps they could do this because they didn’t have so many ideas already—misconceptions. But the village people didn’t imagine that it was perhaps better in our countries. So because they knew less, they asked questions that were more interesting. It was very funny. People really had a nice attitude. When I said, “Oh no, we have no cotton in our country,” the mother of my student disappeared and then came back in five minutes with a cotton bowl to give to me. I’ll show it to my nephews. They’ll be very interested. They’ve never seen cotton because we don’t have it in France. So I’ll save it. I had brought a pressure cooker as a wedding present. I gave it to the young bride, and she immediately gave it to her mother-in-law. Well, of course they’ll use it together. It’s not a big problem. I said I could perhaps explain how to use it. The girl said, “Oh, I wouldn’t dare use it—because I’m not sure—no.” She was a little shy about it. So everybody went out and brought what was necessary, and there were ten people standing around preparing things, reading the directions to see how the ingredients should be put in, then putting the cooker on the fire and waiting fifteen minutes. You know, the manufacturers should write down directions designed particularly for the Chinese. The mother asked about mantou immediately, as soon as she knew what the pressure cooker could do. Mantou and xifan [rice porridge, another breakfast food]. She was right. Very simple things are better. They understood it, and they could use it on the coal stove. In the countryside the fire burns all day. So you put the cooker on, and that’s all. If it’s electric you spend more. In the town that was not very far away—one hour and a half—I saw they were selling lots of pressure cookers, but in this village nobody had seen one. They had washing machines, though. Last year for Spring Festival the family bought a washing machine. My student had decided not to go home for vacation, but when she received a letter from her family saying they had bought a washing machine, she said, “Oh, I have to go home to see the washing machine.” It’s a very simple one. Cold water. No, it doesn’t spin the water out. It’s adapted to the level of technology they have there. It’s also a mark of prestige. The young bride had to have one too. I think it’s too much to have two of these machines in one courtyard, but it’s a sign of prestige. Beautiful site, Carol. And what a wonderful story! Carol, beautifully written. I really enjoyed it. To have these experiences in life are great gifts, to be able to share them so eloquently is priceless. I wonder how much it’s changed since you’ve been there? I really like this story. The villagers that Michelle met remind me of small-town people in the remoter parts of Maine, say about 40 or 50 years ago,- bright, curious, not too technologically advanced folks. You could build a whole story around the pressure cooker. It is a great detail.